Correctly watering plants is one of the most difficult jobs for the novice gardener, but once the basic principles are mastered it will enable you to acquire ‘Green Fingers’ and a passion for gardening. Many factors determine how often and how much water is needed for new plants to thrive. It is much better to water well occasionally, rather than ‘little and often’. A good soak will go deep and encourage the roots to look for water beneath the planting area. Also you can be sure that the compost is thoroughly wet and this will limit the likelihood of large dry air pockets. A little water often results in just the surface being moist, beneath which can remain dry, and neglects the actual roots. Plants need a cycle of water followed by a short period of dryness then a re-water to make a strong root system. As water is taken in by the plant, air is drawn into the microscopic gaps between the soil particles which is then expelled at the next water. The trick is to re-water before the plant gets too dry and is then under stress! If the dry period is too long then the plant has no alternative but to wilt and loose leaves in order to save moisture and try to survive. Most deciduous plants will do this and then re-shoot a month or so later if rescued in time. Evergreens, on the other hand, will often look sad a couple of weeks after a lack of water and by this time it is usually too late to save them. New gardeners often fall into the trap of forgetting to water- seeing the plant wilt or go brown then watering constantly in an attempt to revive it. This mercy mission will quickly finish off the plant with misguided kindness. Fewer leaves mean reduced water transportation, therefore if over-watered the roots will quickly rot off as they are deprived of vital air due to sitting in water. If you see a plant that has unfortunately dried out, then water it thoroughly and then keep it on the dry side until it hopefully reshoots. When planting in the ground the soil type should be considered - sandy and clay soils are greatly improved with the addition of organic compost! Plants will require extra water when the temperature is high, in windier weather and especially when there is lots of fresh new growth during the spring and early summer. Certain varieties of plants need lots of water such as Bamboos, Dogwoods and Astilbes, others need much less like Monkey Puzzle, Fatsias and Lavenders. Most plants are somewhere in between but the key to success is to try and understand your plant’s needs. Beware of high pressure sprayers on the end of hose pipes, make sure that they give enough water – they may feel powerful but it’s likely they are giving less water than you think. It may be best to see how long the long it takes to fill a bucket so you can be sure you are giving enough to the plants at each water. 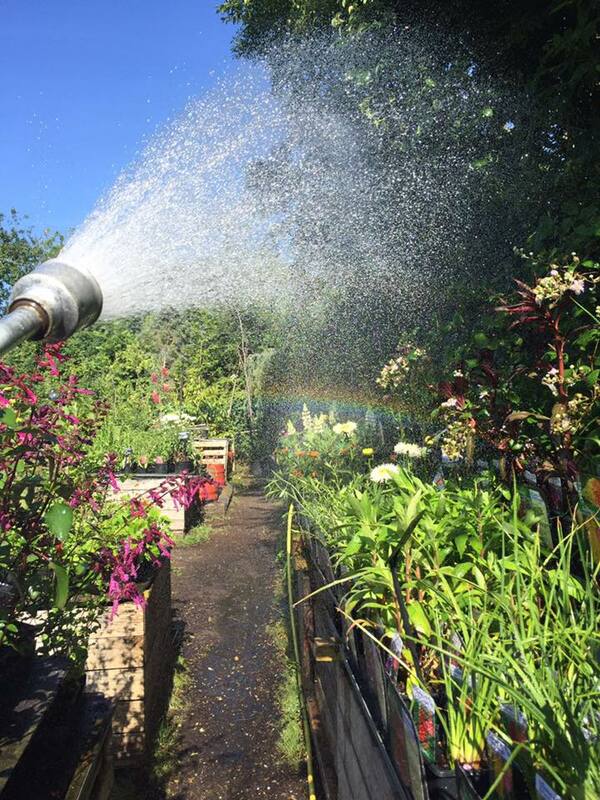 At our nursery we have an automatic watering system which can drench everywhere at the flick of a switch, however we still like to hand water. This can take us up to 8 hours a day and is costly, but we prefer to do this and have lots of green healthy plants for sale. We also like to have the pleasure of tendering our lovely plants in the traditional way and give them lots of old fashioned T.L.C. We hope you do the same and give our plants a good home. Please see below for our quick watering guide. Water well at intervals rather than little and often. Evergreens may need water in the winter from time to time. Plants in pots need checking often (each day in spring and summer or if pot bound).